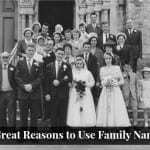 Choosing a name from your family tree can be great – it simples up the process of finding the right name, and it will doubtless please the honoree. There’s a built-in story for your child, too, one that connects her to earlier generations. But it isn’t for everyone, and there are some excellent reasons to forgo the family name and start fresh. It’s not always easy, though. 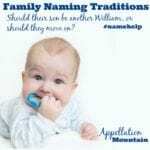 The pressure can be considerable, especially if the traditions are long-standing, or others in your generation have already embraced family names. … traditions end up being most pleasing and least burdensome when they’re FLEXIBLE. And this list of ways to name a baby after someone without actually using that person’s name might be helpful. 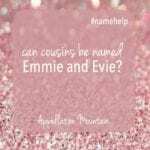 But maybe it’s time to forget the family names, and start fresh, with a name that you and your partner choose. Here are eight signs that it might be time to forget the family names. 8. Not every name is ready for revival. You adore your grandma Eunice. Her name? Not so much. Plenty of names fall into style limbo, whether they’re antiques like Wilfred and Beulah, or Boomer names like Donald and Barbara. If you just can’t bring yourself to pass on a name that feels clunky or burdensome, don’t. Even if it means breaking with family tradition. Some families are comfortable with using it as a middle name. If that’s you, great. But if even that bothers you, pass on Eunice and Wilfred and company, and know that your loved one will love your child – no matter what. 7. There’s one family name you can see yourself using – but only one. His dad is James, and so is your beloved grandfather, and your favorite brother. (Who is never having a family of his own, as he’s a Catholic priest.) Why wouldn’t you name your firstborn son James? Think ahead two or three children. Can you give your firstborn a family name without creating expectations that future offspring will honor other relatives? If the answer is yes, please proceed. But if you’re not so sure … then take a minute and really think about how your family will react when they find out that you’re not honoring the other grandparents. If there will be dashed expectations, maybe James isn’t the right choice for baby #1. 6. Your family relationships aren’t exactly the stuff of Norman Rockwell. Do you honor your family even if your relationships are flawed? Maybe. Younger married couples don’t always adore their in-laws. But this changes over time, and grandchildren have a way of accelerating things. If you’ve had a few awkward holiday dinners or find their politics baffling, don’t discard family names. But let’s face it – plenty of family relationships fall into a whole other category of real pain. Sometimes ugliness. In this case, obviously you shouldn’t feel obligated to hand down names – whether you’re still in touch with those family members or not. Things get more complicated when you’re happy to name children after his supportive, warm family – but cannot imagine using names from your distant, dysfunctional side. Let’s just say this: honor names are supposed to honor loved ones. Only you can say who is included in that definition. 5. Your loved one doesn’t love her name. This is always an interesting wrinkle. Your mom Katherine detests nicknames, and is always Katherine in full, thanksverymuch. You’d love to name your daughter Katherine – but only if you can call her Kate, the nickname your mother so heartily dislikes. Is it an honor if the honoree dislikes her name? It depends on what’s more important. For some families, it’s about connecting their children to the past. In that case, the connection trumps feelings about the name. But if you’re more focused on pleasing grandma, then handing down a name she won’t love might not be the way to go. 4. You’re planning a large family, and don’t want to be locked into a pattern. You’ve named your son after his paternal grandfather, and your daughter after your maternal grandmother. 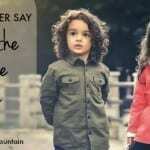 Now you’re expecting boy/girl twins, and while the boy’s name is a family favorite from your side, the girl’s name is … just something you’ve always loved. Will all those other women in your family be insulted? It depends on the family. I’ve wrestled with this one. Our son has names from both sides of his family tree. Our daughter is named after my side only. If we had a second daughter, would we honor his family? My favorite girl’s name is another from my family tree … but I can imagine that might cause some hurt feelings. With two kids, we’ve sidestepped that particular problem. But if you’re hoping to fill a mini-van, it might be worth considering how many family names you can use before the well runs dry. 3. The name might be a lot to live up to. You love his grandfather, the distinguished judge. Passing down his name means that your son will also be James Smith, in a town where the local high school is James Smith High. While such dramatic examples are probably few and far between, it’s worth considering whether passing on a name will feel like you’re passing on expectations as well. 2. It just plain takes the joy out of choosing. It is perfectly reasonable to feel that previous generations have named their children, and it is your turn to do the same. Even if your husband is James Smith IV, and you’d be letting down everyone by naming your son Mason Smith instead … if that’s what feels right to you, name your son Mason. Or Elliot. Or Prometheus. Family names should be freely given – no matter how much others might hope you’ll consider them. 1. It just doesn’t feel like a fit. This is the hardest to articulate. Sometimes you like the idea of family names. And the names available are fine – in fact, you’d always thought you might name your daughter Elizabeth after your grandma. But now you’re actually expecting a daughter – and no matter how you twist it around in your brain, her name just isn’t Elizabeth. In this case, starting fresh can be the best approach – even if you ultimately settle on Caroline or Margaret, something with the same vibe as the classic Elizabeth. Even if the name you select is unpopular with your extended family, this one is your call – along with bedtime routines, when to start solids, and dozens of other decisions. Family names can be great, but if they’re not great for you, that’s a perfectly valid option. And an opportunity to choose another great name that, who knows?, might become a future family name in another generation or three. 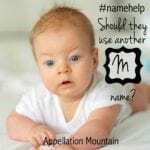 Did you consider family names for your children? I would have loved to have named a child in honor of my amazing Great-Aunt Doris. But, no, sorry, not naming any daughter of mine “Doris”. Her middle name, though was “Emma” — rather too trendy for my tastes, but certainly a candidate…except for the fact that she always hated it. How can you honor someone by naming someone after them using a name they hated? Luckily, first dibs for family-honoring went to my even more amazing Great-Grandma Rose (whom we *suspect* was christened Rosalia, but she would never admit to it). Amongst her great- and great-great-grandchildren, she now has 4 namesakes (Linse, Rinnah, Gwendolyn, and Briella). She only got to meet the first, but I love how years from now we’ll be able to collect all the Roses together and tell stories of the amazing woman they were named for. My middle name is a mash-up of my great-grandmothers’ (Maria and Mary = Marie) So while it is an incredibly common MN, I had a story behind it, and I liked it. It also fit into a middle initial “M” tradition my grandmother started. My mom and aunts and I all have it. But I went with the mash up (Estelle and Betty = Elspeth) for my oldest girl, and she has a G initial after my stepfather. If we had had a boy, it would have been (great grandfather) Robert and (grandfather) Richard = Roderick. As it was, my youngest has Robin as her middle. I am a firm believer in “everybody in the family has their own distinct name,” but I love that the girls have tie-ins. I adore your mash ups! This is my challenge right now. We have great family options for girls names but of course, we’re having a boy. Our oldest son has my grandfather’s name as a middle and we’re feeling pressure with our little boy on the way. My maiden name is one of those surnames that is getting popular as a given name. It would be a great option but I’ve always had a challenging relationship with my dad and his abusive family. So, I was happy to abandon my maiden name when I got married and I don’t think I could ever use it. My husband’s family has several men worthy of being honored but they have super clunky outdated names. Not like funky hipster clunky but like unusable in 2014 clunky. Plus my husband’s family is all German and Polish so the surnames are multi-syllabic and challenging to pronounce. So, now we’re facing the challenge of whether we pick a name we love and accept that there may be hurt feelings. There’s really no easy decision. It’s nice to hear we’re not the only ones with this challenge. I had this issue but went ahead and used my maiden name anyway. I’m glad I did. My son is named after me, because It is MY maiden name. It also helps that my sisters have kept the surname, so it is a nice way of tying my bubs’ name to them too. All of my children have family middles. We have a huge family so there are no expectations that all relatives will be represented in the grandchildren’s names (even with 45 grandkids so far on one side). I almost named my fourth son Eli Winston because I ADORE Winston Churchill, but in the end I changed it (having to spend money to do it, silly me) because I didn’t like having a child without a family middle. I’ve always been grateful I changed it. We were trying to connect the generations. As for fusty names–I like them, so that worked out well! We have seven children (come December) and because one middle honored both sides of the family, we actually have an even representation without our planning it that way. I can’t imagine anyone in either of our families caring, though. The greatest thing for me was when we named our son Oskar John after my maternal grandfather and my mother cried. She misses her dad and he was the grandparent I was closest to. It matters a lot more to her that she has a grandchild named after her dad than having yet another one named after her (although she never would have pressured me or anything–that’s weird). This baby due in December will have the middle name Mildred. I’ve had people raise their eyebrows and make disgusted faces when I’ve told them the name, but I don’t care. I love the name and the person.. The only relative’s name I vetoed that I would have liked to honor was named Bertha. Just couldn’t do it. My parent came very very close to naming me and my brother after family members. My brother was almost Steven after my mother’s father and brother except those two weren’t the best role-models. And my dad hated being a jr. so that was already off the table. For me, some relatives on my dad’s side actually tried to bribe my mother with inheritance goods to name me Caroline Covington Last-name. That only ended up ticking off my parents, so it turned into a splendid backfire. In the end, my brother and I were named according to names that they loved and we never felt any obligation be like anyone else but ourselves. We elected to do family middles, which is what my husband and I both have, but we were going to switch up what we did for a boy’s middle name. I wondered how that would be received, but since we had a girl, it was a moot point. What we did face with our daughter, though, was that she was named for two great-grandmothers (one on my side, one on my husband’s). While the great-grandmas shared a name, they didn’t share a common spelling – something we didn’t realize until very close to the birth. Obviously we had to select one and that seems to have left some bruised feelings on the ‘losing’ side. We feel like she’s named for both of them regardless, but I’m not sure everyone shares that perspective. In my family, I’m the only one without a family first name. I’m the oldest, and my name is basically just one that my parents liked that was popular at the time. My middle is for my mom. My sister has a smoosh name that honors about 6 people in 2 syllables, and her middle is for another aunt. My brother is named after his father (first) and maternal grandfather (middle). We seriously considered using Neda Maria and Elena Josephine (for Edna, Maria, Helen, and Josephine – the girls’ great grandmothers), but in the end, just went with names we liked. I like this article a lot. Our of our 3 kids, only the 2nd has a family name and it’s in the middle spot. I kind of feel a little bad that the other 2 didn’t get any family ties. Especially when you hear people telling about their kids names and they’re like “It’s a family name – not just a name that we liked.” Like family names are “better”. I did consider passing on the name Edith in the middle for my daughter, but the beginning ran into the end of her first name. And my Mum dropped the tradition by not using it in my name (it was her middle, her Mum’s middle and her Nanna’s name.) That was because she didn’t like the name anymore, so it felt a bit weird to consider it again. Oh and I considered using Joy to honor her (Joyce, but she wished she was Joy) but then Rose Joy sounded too short and choppy. And then I considered George being George Alfred after my great grandfather, but it sounded super old-man and then the A sound right after “George” made me think too much of the name Georgia and so that didn’t flow quite right either.